4/10/2019 - Each year, the University of Wyoming holds the Undergraduate Writing Contest. There are three areas you can submit for -- poetry, fiction, and non-fiction -- and each is judged individually. The Philosophy Department is proud to announce that Darren Leonhardt has won the poetry section of the UW Undergraduate Writing Contest. We are pleased to be able to share his winning poem, Expansion. 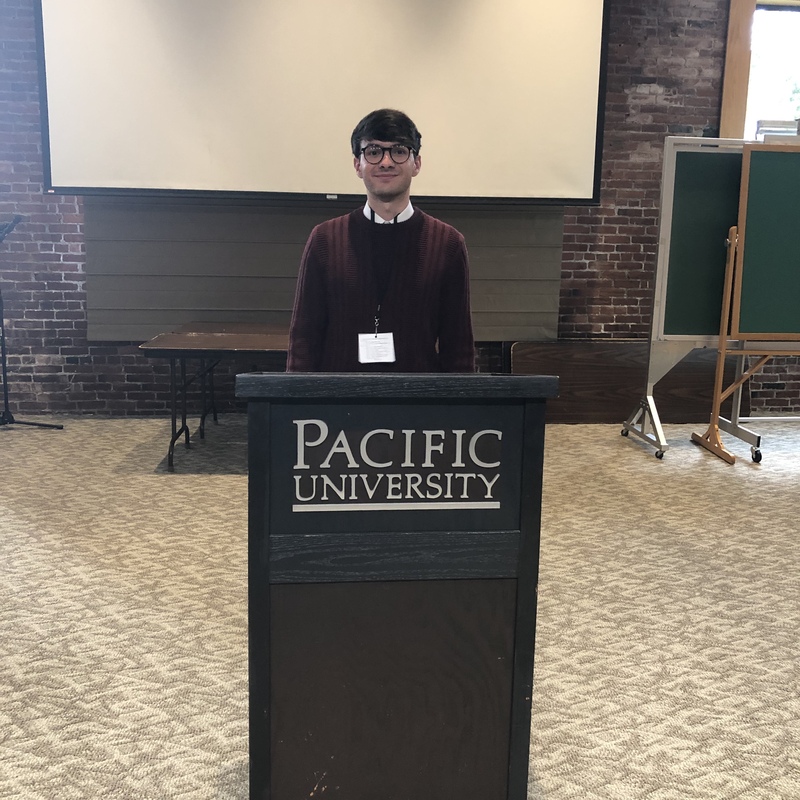 The Philosophy Department congratulates Ryan Lynch on the presentation of his paper “What is an Art Work?” Ryan presented his paper at the Pacific University Undergraduate Philosophy Conference, April 5 – 6, in Forest Grove, Oregon. Ryan wrote the original version of his paper for the class he took with Prof. Brad Rettler. 3/12/2019 - Advancing the field of education in prison and efforts to support formerly incarcerated people in their transition to freedom is the purpose of the University of Wyoming’s Symposium on Transformative Education in Prison and Beyond. The two-day, solution-oriented conference will consist of various panel discussions, interactive workshops and keynote addresses by leaders in the field. The free event is March 29-30 in the UW Conference Center. Damon Horowitz and Jody Lewen are scheduled keynote speakers. Horowitz is a philosophy professor and serial entrepreneur, working at the intersection of technology and the humanities. He recently served as consulting philosopher at AltSchool, a B-corporation focused on using technology to bring personalized progressive education to a broader population. Previously, he was in-house philosopher/director of engineering at Google, leading a companywide personalization initiative with a focus on data privacy issues. He also has taught philosophy coursework to prisoners in California. Lewen is the founder and executive director of the Prison University Project, which operates the college program at San Quentin State Prison in California. The program provides a general education Associate of Arts degree and intensive college preparatory courses to about 350 incarcerated people. The Prison University Project also provides training and technical assistance to colleges offering higher education programs in prisons throughout California and across the United States. Panelists are national and international experts in the field. Panel topics include: insights from the Wyoming Department of Corrections, and currently and formerly incarcerated students; philosophy in prison; jail writing programs; transformative technology; theories, practices and challenges in higher education in prison programs; and success beyond reduced recidivism. The symposium is co-hosted by UW’s Department of Philosophy and Religious Studies and Wyoming Pathways from Prison, which previously partnered to bring stoicism programming to Wyoming correctional facilities. Primary funding is through the College of Arts and Sciences, with additional support by the Social Justice Research Center; Wyoming Institute for Humanities Research; School of Culture, Gender and Social Justice; Department of English; College of Education; College of Law Defender Aid Clinic; and the national Correctional Education Association. Preregistration for this free event is highly encouraged. For more information and to register, visit www.uwyo.edu/stepb. 3/1/2019: The paper titled “Bundle Theory and the Identity of Indiscernibles” has been accepted for publication in a forthcoming edition of the journal Res Philosophica. This article is co-authored by our very own Brad Rettler. Jeffrey Lockwood, Professor of Philosophy, University of Wyoming, presented The Rocky Mountain Locust: From Magnificent Profusion to Mysterious Extinction Sept. 29, 2018, at the Teton County Library, Jackson, WY. We are extremely excited to welcome two new philosophers to our department, Brad and Lindsay Rettler. Brad is a specialist in both metaphysics and the philosophy of religion. He received his PhD from the University of Notre Dame in 2014, and has taught at Baylor University in Texas and at Fordham University in New York City before coming to UW. He has already an impressive publication record, with articles in journals such as Philosophical Studies, Pacific Philosophical Quarterly, and the European Journal for Philosophy of Religion. At UW, he will continue to teach courses in metaphysics and related areas, as well as in the philosophy of religion. Lindsay will be teaching one course per semester, concentrating on applied ethics at first. She received her PhD from Ohio State University in 2015, and her research is focused on epistemology and moral psychology. She has published in venues such as the American Philosophical Quarterly and Synthese. With Brad and Lindsay on board, the philosophy program is more vibrant and stronger than it has been in a long time.